There are hundreds of wireless earbuds already available online with plenty of decent features including connectivity and battery packs again with portable battery chargers to ensure continuous full day use, however looking at productivity and quality of output there are few to count, see our review on 'Some of the best wireless earbuds in the market'. Schatzii is a California-based brand developed by Cleer Gear LLC and has some of the great day to day accessories including wireless earbuds, power chargers, docks, accessories and much more. 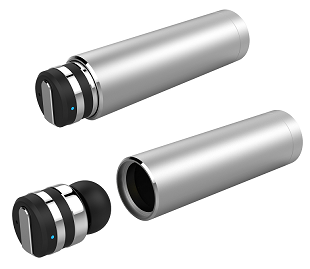 The Bluetooth earpiece is 2cm long x 1.5cm wide and firmly fits in an ear. It is lightest in an industry with just 3gms and has 80hrs of standby and up to 90 mins of continuous talk time. Yes, it is less, but that's why these earbuds come with charging packs which one can easily carry all the time. Its small attractive LED will help you know its charging status. At a slightly higher price tag of $126.49, Schatzii Bullet X is a true masterpiece. You are a music lover? Then you won't like a single earpiece and may need a pair. 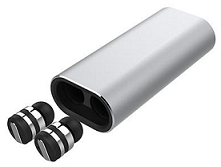 Schatzii also has an excellent wireless earbuds model called Bullet 2.0 Stereo Earbuds. Bullet 2.0 Stereo earbuds are excellent wireless freedom to listen to music and taking calls. It is again world's smallest earpieces with Bluetooth V4.1 connectivity and high capacity 2100 mAh charging case. It provides up to 12X charge and supports CVC active noise reduction and echo cancellation.